Facebook was the top-searched term overall in 2010—as it was in 2009—accounting for 2.11% of all searches, according to an Experian Hitwise analysis of the top 1,000 search terms for 2010. Moreover, Facebook was the top-visited website (for the first time) in 2010, accounting for 8.93% of all US visits, Experian found. Below, additional findings and analysis issued by Experian Hitwise. Four variations of the term "facebook" were among the top 10 terms and accounted for 3.48% of searches overall. The term "facebook login" moved up from the 9th spot in 2009 to the second spot in 2010. 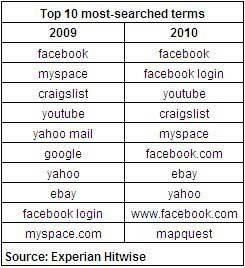 YouTube was the third most-searched term in 2010, followed by craigslist, myspace, and facebook.com. Analysis of the search terms revealed that social networking-related terms dominated the results, accounting for 4.18% of the top 50 searches. When combined, common search terms for Facebook—e.g., facebook and facebook.com—accounted for 3.48% of all searches in the US among the top 50 terms, or a 207% increase vs. 2009. YouTube terms accounted for 1.12%, or a 106% increase vs. 2009. Aol search terms accounted for 0.34% of searches in 2010, but grew 22% vs. 2009. Google terms accounted for 0.63%, and Craigslist terms accounted for 0.62%. New terms that entered into the top 50 search terms for 2010 included netflix, verizon wireless, espn, chase, pogo, tagged, wells fargo, yellow pages, poptropica, games, and hulu. Facebook was the top-visited website (for the first time) with 8.93% of all US visits between January and November 2010. Google.com ranked second with 7.19% of visits, followed by Yahoo Mail (3.52%), Yahoo (3.30%), and YouTube (2.65%). The combination of Google properties accounted for 9.85% of all US visits. Facebook properties accounted for 8.93%, and Yahoo properties accounted for 8.12%. 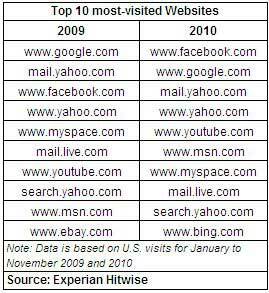 The top 10 websites accounted for 33% of all US visits between January and November 2010, an increase of 12% vs. 2009. The top generic search term was "hulu" within the Television category. Sports: The top searched for athlete was Tiger Woods and the top sports team was the Dallas Cowboys from within the Sports category. News and Media: The top searched-for person was Bret Michaels followed by Tiger Woods and Sandra Bullock within the News and Media category in 2010. Employment: Indeed accounted for 2.47% of all searches in the US among the top 50 terms for the Employment category in 2010 when combining common search terms—e.g., indeed and indeed.com. About the data: The cited data is from Experian Hitwise, featuring the top search terms and websites for 2010, based on Jan-Nov data.